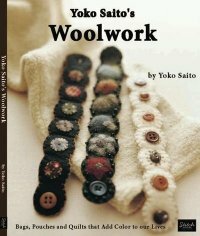 Yoko Saito delights her audience with this book that focuses on quilts, bags and other projects made primarily of wool and yarn-dyed homespuns. Instructions are included for rug hooking, needle-felting, piecework and appliqué. The projects, practical with a touch of whimsy, will have you scouring closets for no longer used woolen clothing to turn into something fun and new. The weather will be frightful, but we'll be delightful! 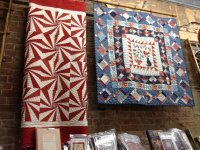 Your chance to see the big reveal and to have first dibs is this Sunday, Nov. 24, beginning at 2 p.m. We had more than 70 people show up to the spring Quiltapalooza, so you'll want to get there on time! Lots of goodies, stories and more. Polly Minick and Laurie Simpson have lent us four of their stunning quilts. Their trunk show is just here at the shop for a limited time, so you'll want to stop and see them as soon as possible. Their use of utility quilting and applique make a bold statment. This is a reminder that your class time has moved to Mondays from 10 a.m. to 12 p.m. You have only two sessions remaining and you don't want to miss them. Get all your Santa redwork completed before the Christmas season. The shop will be closing early on Wednesday, Nov. 27, at 2 p.m. and will remain closed on Thanksgiving. Happy Turkey Day! 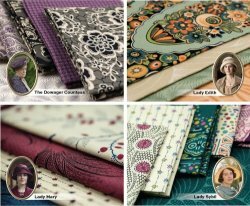 In case you missed the excitement last week, all four ladies' fabric collections and their companion prints from Downton Abbey have arrived at HIQ. It's gorgeous! For each yard of Downton Abbey fabric you purchase, you'll receive a complementary photo of yourself and friends in our Downton Abbey Photo Stand-In. You can be Lady Edith, Lady Sybil or Lady Mary! We'll print your photo here at the shop. We have also cut a 2.5'' roll that contains all 37 Downton Abbey fabrics and three complementary solids for only $39.99. Presencia Perle Cotton Size 8 & 12 and Presencia Mouline Finca Floss are 50% off! Presencia is a great floss and perle cotton, but we need to make room for more threads. Floss was $1.29-$4.99, now $0.65-$2.50! Size 8 & 12 Perle Cotton was $2.99-$3.99, now $1.50-$2.00! We are running out of several colors, so get yours today! Monday - Saturday 10 a.m. - 5 p.m.; Thursday 10 a.m. - 7 p.m.